Background and objectives Extended criteria donors represent nowadays a main resource for kidney transplantation, and recovery criteria are becoming increasingly inclusive. However, the limits of this approach are not clear as well as the effects of extreme donor ages on long-term kidney transplantation outcomes. To address these issues, we performed a retrospective study on extended criteria donor kidney transplantation. Design, setting, participants, & measurements In total, 647 consecutive extended criteria donor kidney transplantations performed over 11 years (2003–2013) were included. Donor, recipient, and procedural variables were classified according to donor age decades (group A, 50–59 years old [n=91]; group B, 60–69 years old [n=264]; group C, 70–79 years old [n=265]; and group D, ≥80 years old [n=27]). Organs were allocated in single- or dual-kidney transplantation after a multistep evaluation including clinical and histologic criteria. Long-term outcomes and main adverse events were analyzed among age groups and in either single- or dual-kidney transplantation. Kidney discard rate incidence and causes were evaluated. Results Median follow-up was 4.9 years (25th; 75th percentiles: 2.7; 7.6 years); patient and graft survival were comparable among age groups (5-year patient survival: group A, 87.8%; group B, 88.1%; group C, 88.0%; and group D, 90.1%; P=0.77; graft survival: group A, 74.0%; group B, 74.2%; group C, 75.2%; and group D, 65.9%; P=0.62) and between dual-kidney transplantation and single-kidney transplantation except for group D, with a better survival for dual-kidney transplantation (P=0.04). No difference was found analyzing complications incidence or graft function over time. Kidney discard rate was similar in groups A, B, and C (15.4%, 17.7%, and 20.1%, respectively) and increased in group D (48.2%; odds ratio, 5.1 with A as the reference group; 95% confidence interval, 2.96 to 8.79). Conclusions Discard rate and long-term outcomes are similar among extended criteria donor kidney transplantation from donors ages 50–79 years old. Conversely, discard rate was strikingly higher among kidneys from octogenarian donors, but appropriate selection provides comparable long-term outcomes, with better graft survival for dual-kidney transplantation. In 1999, the analysis of >46,000 patients waitlisted for kidney transplantation (KT) provided the first strong evidence of KT superiority over dialysis as therapy for ESRD (1). Subsequently, significant improvements were also observed for elderly, diabetic, obese, and cardiopathic patients as well as most of the subjects displaying other major comorbidities (2–6). Since then, the widening gap between transplant demand and supply has prompted the expansion of kidney recovery criteria (7). The use of elderly donors resulted in acceptable but reduced graft survival, with a greater susceptibility to delayed graft function (DGF) and KT rejection (8,9). In this field, several strategies have been proposed to improve organ allocation policies; among them, old for old protocols aim to match the supposed graft survival to recipient life expectancy (often irrespective from HLA match) (10), and the dual-kidney transplantation (DKT) is intended to overcome the imbalance between limited nephron mass from older donors and the recipient metabolic request (11,12). Nowadays, in many countries, about 30%–60% of deceased kidney grafts are included in the so-called extended criteria (13,14). However, as witnessed by the heterogeneity of organ discard rate across the transplant community (15), the limits of this policy are not well defined, despite the development of several scoring systems (16–18). In particular, donor age still represents a major reason for organ discard, and to our knowledge, very few studies have evaluated the outcomes of kidneys from donors older than 70 years old (19). To address these questions, we retrospectively analyzed our experience over 11 years by classifying KT from extended criteria donors (ECDs) in donor age classes and emphasizing the most relevant long-term outcomes together with the associated risk factors. All of the deceased donor KTs performed at Turin University Renal Transplant Center “A. Vercellone” from January of 2003 to December of 2013 were considered. From 1199 consecutive transplants, we excluded multiorgan grafts; within the remaining 1124, we identified a total of 647 KTs from ECDs. According to Crystal City criteria (7), we defined ECDs as all of the donors older than 60 years old and those ages 50–59 years old with at least two of the following characteristics: serum creatinine at procurement >1.5 mg/dl, cerebrovascular cause of death, or history of hypertension. The recipients’ follow-up was performed with scheduled clinical visits or hospital admissions when major complications occurred. Data were collected from patients’ individual charts. All procurement and post-transplant kidney biopsies were analyzed by a single group of pathologists unchanged throughout the study period. Follow-up ended in November of 2015. The study was approved by the local ethics committee and performed in adherence with the last version of the Helsinki Declaration. The clinical and research activities being reported are consistent with the Principles of the Declaration of Istanbul as outlined in the Declaration of Istanbul on Organ Trafficking and Transplant Tourism. Patients were divided in four groups according to donor age: group A, 50–59 years old; group B, 60–69 years old; group C, 70–79 years old; and group D, ≥80 years old. Main outcomes were graft and patient survival. Secondary outcomes were graft function at 1, 2, and 5 years, DGF incidence, and acute rejection. Furthermore, we evaluated the causes of graft failure and patient death as well as the occurrence of other relevant post-transplant complications. DGF was defined as the need for hemodialysis during the first post-transplant week. Acute rejection was biopsy proven. Kidney discard rate (KDR) was defined as the ratio between recovered but not transplanted and total recovered kidneys. Suitable candidates were preselected by an algorithm on the basis of three parameters: AB0 blood group, HLA (with a minimum requirement of one DR and one A locus match), and age range between donors and recipients ±7 years. Lack of dialysis access, high titer of panel reactive antibodies, and time on waiting list >10 years were criteria for preferential listing. Subsequently, several parameters (donor age, cause of death, kidney function, proteinuria, echography renal size, cardiovascular or metabolic comorbidities, and smoking) were analyzed to allocate kidneys directly to single-kidney transplantation (SKT) or histologic evaluation. When needle biopsy was performed, organ allocation was accomplished on the basis of Karpinsky score. Between 2003 and 2006, we applied the policy proposed by Remuzzi et al. (20) (score 0–3 to SKT, 4–6 to DKT, and ≥7 discarded); subsequently, score 4 was considered suitable for SKT on the basis of our favorable results in a pool of patients transplanted in 2006 (M. Messina, G.P. Segoloni, L. Biancone, unpublished data). The efficacy of this approach was later confirmed by other authors (21,22). When donor age was >82 years old, organs were independently allocated to DKT for any score <7. In the few doubtful cases, SKT/DKT allocation was on the basis of a multidisciplinary assessment (nephrologist, surgeon, and pathologist), and the other considered variables were donor eGFR, renal size, and macroscopic organ appearance at surgeon inspection. Main recipient exclusion criteria for DKT were age ≥70 years old, chronic anticoagulant therapy, coronary artery disease, severe chronic obstructive pulmonary disease, and previous KT. Immunosuppressive protocols were homogeneous for the whole study period and specifically designed for ECD KT: induction mainly with anti-CD25 antibody, use of steroid and mycophenolate from the beginning, and sequential introduction of calcineurin inhibitor at the established graft functional recovery (serum creatinine ≤2.5 mg/dl) (23). None of the retrieved kidneys had pulsatile perfusion. Discrete data were described as percentages and analyzed with the Pearson chi-squared test or for small samples, the Fisher exact test. Continuous variables were described as mean±SD when normal and median (25th; 75th percentile) when non-normally distributed. Mann–Whitney test, Kruskal–Wallis test, paired t test, or ANOVA with Bonferroni post hoc test were used when appropriate. Cumulative graft and patient survival were analyzed by Kaplan–Meier (KM) curves including only the first transplant (n=573). Differences among groups were established by log rank tests. Relevant variables were checked first in univariate analysis and then, included in a multivariate Cox model on the basis of statistical and clinical significance. Transplant after the first transplant is considered in this model. The risk of organ discard was displayed as the odds ratio (OR) calculated by logistic regression using donor age class as the covariate; the reference population was group A. All statistical analyses were performed using SPSS software, version 22 (SPSS, Inc., Chicago, IL). Significance level for all tests was set at P<0.05. The selected population was classified by donor age: group A (50–59 years old) included 91 patients, group B (60–69 years old) included 264 patients, group C (70–79 years old) included 265 patients, and group D (≥80 years old, with a maximum age of 88 years old) included 27 patients. Main donor-, recipient-, and transplant-associated characteristics are comparable among the four classes (Table 1). The only dissimilarities were observed in DKT prevalence and recipient age as a consequence of our allocation criteria (Materials and Methods). Age distribution is showed in Supplemental Figure 1. Another significant difference was found when analyzing recipients’ native nephropathies, with the highest incidence of glomerular diseases in group A, whereas hypertensive nephropathy predominated in group D (P=0.05) (Supplemental Table 1). In total, 688 kidneys from ECDs were transplanted in 647 recipients; in the 567 preimplantation biopsies available, no differences were found in Karpinsky score among the four groups (group A, 2.5±1.1; group B, 2.4±1.0; group C, 2.4±1.0; and group D, 2.9±1.4; P=0.09). By KM curve analysis, we investigated the donor age association with patient and graft survival (Figure 1). Median follow-up was 4.9 (2.7; 7.6) years without differences in the four subpopulations (Supplemental Figure 2). Similar patient and graft survival in different donor age classes. In the KM model, patient survival was similar among the four groups, irrespective of the allocation policy in SKT or DKT (at 5 years: group A, 87.8%; group B, 88.1%; group C, 88.0%; and group D, 90.1%; P=0.77), as it was for graft survival (5 years: group A, 74.0%; group B, 74.2%; group C, 75.2%; and group D, 65.9%; P=0.62), even in death-censored curves (5 years: group A, 82.3%; group B, 83.8%; group C, 83.9%; and group D, 76.5%; P=0.66) (Figure 1). No significant difference was found when death and graft loss causes were compared among the four subsets (P=0.10 and P=0.87, respectively) (Supplemental Tables 2 and 3), even if oncologic mortality displayed an age-related trend (0% in group A versus 7.4% in group D). Likewise, by comparing SKT and DKT, irrespective from donor age classes, we found no significant difference for patient or graft survival, even when data were censored for death. We subsequently analyzed DKT and SKT within the study groups, with the exception of group A, which was excluded due to its negligible number of DKT (one of 91). 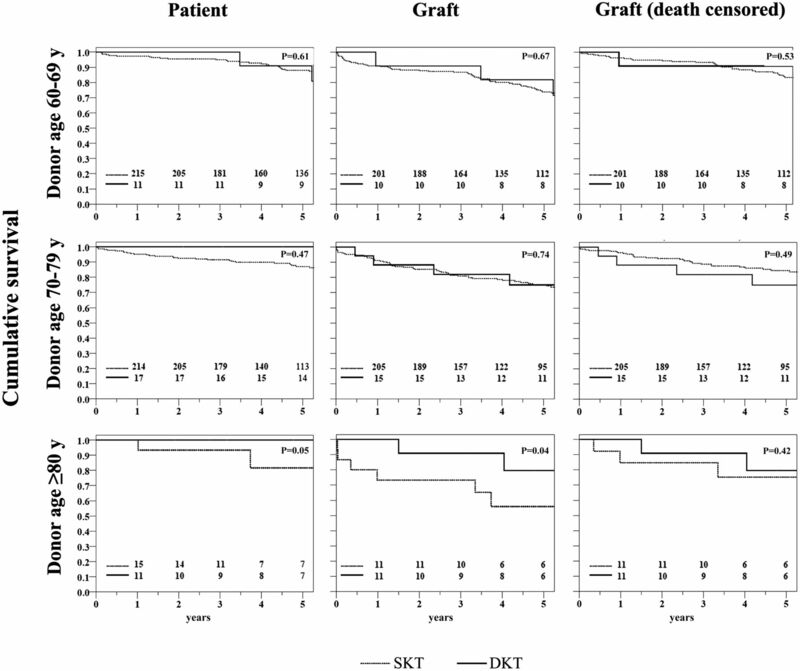 Outcome similarities between DKT and SKT were confirmed in groups B and C, whereas DKT from octogenarians showed better overall graft survival (P=0.04) (Figure 2). Group D SKT also had worse results compared with SKT from the other groups (P=0.03) but not after death censoring (Figure 3). 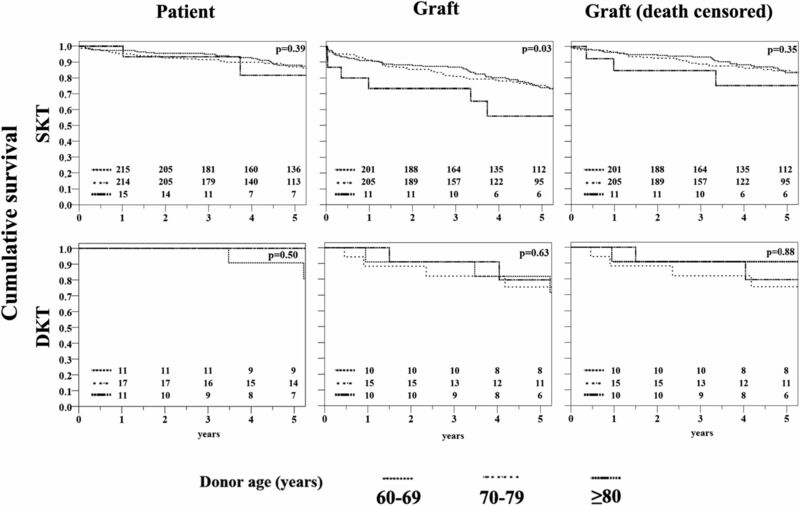 Patient and graft survival according to allocation modality in the different donor age classes, with better graft survival for DKT from octogenarian donors. DKT, dual-kidney transplant; SKT, single-kidney transplant. Patient and graft survival according to donor age classes in different allocation modality; SKT from octogenarian donors have worse results compared with SKT from the other age groups, when not death-censored. DKT, dual-kidney transplant; SKT, single-kidney transplant. Also, graft function in the four groups was comparable at all considered time points (Supplemental Figure 3A). Likewise, no differences were found when the same analysis was performed within DKT or SKT (Supplemental Figure 3, B and C). Donor age classes did not correlate with the vast majority of considered adverse events, including vascular and urologic complications, new-onset diabetes, and malignancies (Supplemental Table 4). An appropriate statistical power was reached when analyzing groups A, B, and C; this was not true for group D due to the relatively small sample size and number of the events. Acute rejection rates were comparable in the four groups (P=0.80). Regarding DGF, the maximum incidence was reached in SKT in octogenarians (nearly 60%), much higher than in DKT of the same group (27.3%); however, this difference did not reach statistical significance. Additionally, primary nonfunction was absent in group A. It is noteworthy that infection rates seemed to be lower in group D (Supplemental Table 5). This was particularly true for cytomegalovirus (CMV) infection (11.1% versus 26.4% of group A, 31.8% of group B, and 28.3% of group C; P=0.04), and it was not related to pretransplant donor or recipient serology. We then investigated the effect of other variables on main transplant outcomes. Univariate analysis highlighted a significant association of DGF with patient death. Graft loss was more common in older recipients and those who had experienced DGF or acute rejection; however, after death censoring, the association with recipient age was no longer significant, whereas CMV infection emerged as a relevant cause. To confirm these results and exclude potentially confounding factors, a multivariate Cox model was attempted; DGF occurrence and acute rejection but not donor or recipient age were found to be independent predictors of worse death-censored graft outcomes (Table 2). Finally, we analyzed KDR, its underlying causes, and its correlation with donor age (Table 3). KDRs of the three younger donor age classes were similar (50–59 years old: 15.4%; 60–69 years old: 17.7%; OR, 1.22; 95% confidence interval [95% CI], 0.78 to 1.91; 70–79 years old: 20.1%; OR, 1.53; 95% CI, 0.99 to 2.38). Conversely KDR of octogenarian donors was significantly increased (48.2%; OR, 5.10; 95% CI, 2.96 to 8.79). Most of discard causes were age related; in particular, macroscopic flaws and Karpinsky score >6 were found in 20% and 11.8%, respectively, of organs harvested from donors ≥80 years old versus 4.8% and 3.7%, respectively, of those from the youngest ECDs (P<0.001). In this study, we analyzed outcomes of ECD KT according to donor age decades from 50 to >80 years old. Grafts were allocated as SKT or DKT or discarded after a multistep evaluation. Overall, we did not find significant outcome difference among the four age groups; conversely, when SKT/DKT allocation was considered, SKT from very old donors performed worse compared with both DKT from the same class or the other SKT. ECDs are nowadays the most relevant pool of deceased kidney donors in several transplant centers worldwide (14). Very old donors may represent a reliable resource to further expand this class; nevertheless, data on extreme age decades are currently limited. Collini et al. (24) showed encouraging results in 38 KTs from donors >75 years old: graft survival, complication rates, and renal function were only slightly worse than in recipients of younger ECDs. More recently, Gallinat et al. (19) showed fairly good long-term outcomes in 52 KTs from donors ages ≥75 years old using an old for old allocation policy, where only low-comorbidity patients were suitable to receive organs from this ECD group. Conversely, in a large analysis of the United Network for Organ Sharing (UNOS) data, transplants from ECDs older than 70 years old were associated with high risks of graft loss and patient death, especially when allocated to recipients <60 years old (25). These results are partially contradictory, with local experiences outperforming registry data but displaying a relatively short follow-up and a lower number of patients. Additionally, data on donors ≥80 years old are currently anecdotal (26). In this paper, we retrospectively reviewed about 650 KTs from ECDs with a median follow-up of 4.9 years; moreover, to the best of our knowledge, this is the first study specifically focused on donors ≥80 years old and the first study to divide the ECD cohort into decades to specifically investigate age class-related outcomes. Indeed, a previous paper on the UNOS registry data (1995–2008) by Tullius et al. (27) analyzed donor age decades from 40 to 70 years old, but it was not focused on ECD and did not considered octogenarian donors. In our population, donor age classes displayed similar patient and graft survival rates, and renal function was comparable among groups at different times. The overlapping outcomes between SKT and DKT in the three donor age decades from 50 to 79 years old suggest that our allocation system is efficient to avoid underperforming SKT or a DKT excess. Conversely, SKT from octogenarian donors had a significantly lower graft survival rate compared with DKT of the same group. This difference was not confirmed for patient- and death-censored graft survival or when SKTs from group D were compared with those of the other age classes, even if a strong tendency is evident. We than speculated that kidneys from octogenarian donors should be preferentially allocated to DKT. However, our results might be influenced by our recipient selection policy and should be confirmed with larger studies. According to these findings, organs from extremely aged donors represent a resource that should be accurately evaluated. In the near future, by routinely expanding novel evaluation tools (i.e., analyzing vascular resistance and perfusate biomarkers during kidney machine reconditioning or donor urinary biomarkers for ischemia-reperfusion injury [28–30]), an even more accurate allocation will be possible. A possible criticism of our multistep algorithm is the increase in cold ischemia time (CIT), which may be particularly relevant for these fragile organs as reaffirmed in a recent work by Aubert et al. (15). This putative additional risk has to be counterbalanced by an efficient multidisciplinary approach able to restrain procedural times. In our experience, CIT was limited to 18 hours, shorter than the threshold of 20 hours associated with worse outcomes in a large cohort of KTs (31). Interestingly, Tanriover et al. (12) analyzed UNOS records of ECD KT performed almost in the same period of this study (i.e., 2002–2012); data were classified according to donor risk categories and CIT ranged between 18.1 and 25.5 hours. It should be highlighted that we used an ECD-dedicated induction protocol to avoid early calcineurin-inhibitor toxicity and limit DGF occurrence (23). With regard to infections, it is intriguing to find lower rates in recipients from the oldest donor class, discordantly with previous literature evidences (32), even if this study is not empowered to analyze this issue. This could possibly be because of tailored maintenance immunosuppressive protocols aimed to spare steroids and mycophenolate and/or reduce calcineurin-inhibitor levels in the older recipients. Another explanation might be the a priori selection of candidates for DKT who are at a greater extent in the oldest class of donors. Despite the tailored immunosuppressive load, we found comparable acute rejection rates in the four classes. This result could be expected as a cause of impaired immunoreactivity of the elderly. On the other side, the higher immunologic risk associated with an organ from an older donor as underlined by Tullius et al. (27) must be taken into account. As confirmed by the Cox regression model, DGF and rejection rate remain key risk factors, even in the ECD scenario; CMV infection is an additional risk accordingly to a previous report (33). A monocentric study is perceived as inferior with respect to multicentric or registry data analysis. However, retrospective multicenter studies may include data from groups applying different allocation policies or heterogeneous immunosuppressive strategies. Also, registry studies have the advantage of analyzing a large amount of data; however, several aspects are not included in databases, and again, data are collected from centers with different clinical policies. Our study is characterized by a wide range of data coming from 650 KTs performed with the same surgical and clinical management, the same team of expert pathologists, and the same team of transplant nephrologists who followed the patients in the long term with all data recorded in patients’ charts. These prerequisites may consistently limit several confounding variables that could have deeply affected study results. Organ selection policy deeply influences the reliability of transplant programs and concerns the extent of waiting lists and short- and long-term KT outcomes; thus, we considered KDR analysis as an essential element of this study. Compared with the largest KT registries worldwide, KDR of donors ages 50–80 years old was lower than in the UNOS reports and consistent with the Eurotransplant program reports (12,34); conversely, a striking increase is evident for donors older than 80 years old. Major causes of organ discard were biopsy findings (Karpinsky score >6) and macroscopic flaws; both were strictly age related. Surprisingly, this trend was not observed for donor-related contraindications discovered after organ harvesting (especially neoplasia). Notably, selection criteria remained unchanged for all donor classes. These findings suggest that organs from octogenarians require an accurate evaluation; however, they should not be excluded from KT programs as underlined by the acceptable outcomes displayed. In conclusion, in this study, we analyzed the long-term experience of ECD KT including very old donors (70–79 and ≥80 years old). Our data suggest that these extreme ECDs are a valid source of organs but that they have to be accurately selected and managed with dedicated protocols, especially with regard to octogenarian donors. Therefore, an a priori selection of donors only on the basis of age cutoff is unjustified for not only donors between 70 and 79 years old with KDRs similar to those of younger ECDs but also, donors 80 years old and older, among whom >50% of harvested kidneys were transplanted with acceptable long-term results. The authors thank Dr. G. Mazzucco for her evaluation of renal biopsies. This work was selected for poster presentation at the 53st European Renal Association-European Dialysis and Transplant Association (ERA-EDTA) Congress in Vienna, Austria held on May 21–24, 2016. This article contains supplemental material online at http://cjasn.asnjournals.org/lookup/suppl/doi:10.2215/CJN.06550616/-/DCSupplemental.